and found it strange that they should be the same even though they are not at all related. 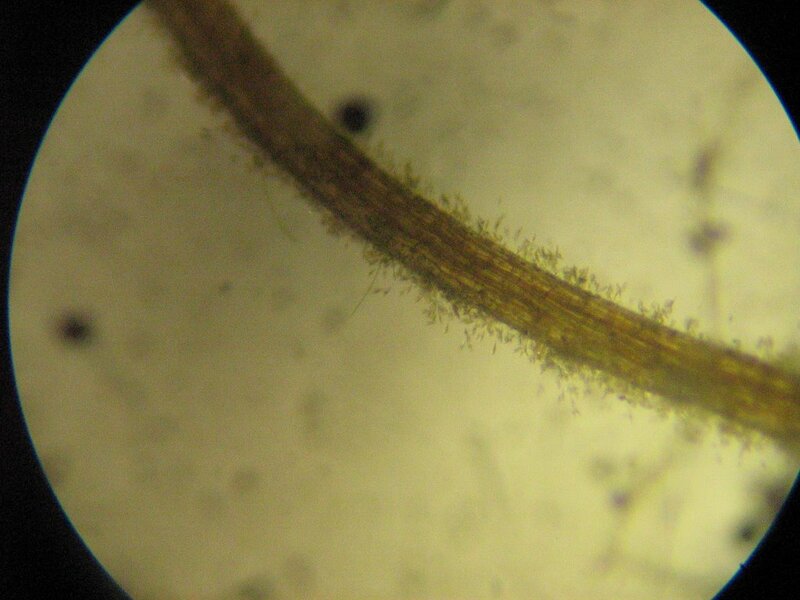 Maybe the rootlets are infected with a .The mycorrhiza would assist the plants in obtaining phosphorus and nitrogen from the water while they in turn benefit by obtaining energy from the plants.The design of these two species shows convergence,with both solving their problems the same way. On the surface of the water there is what looks like a of green smudge covering much of the pond. 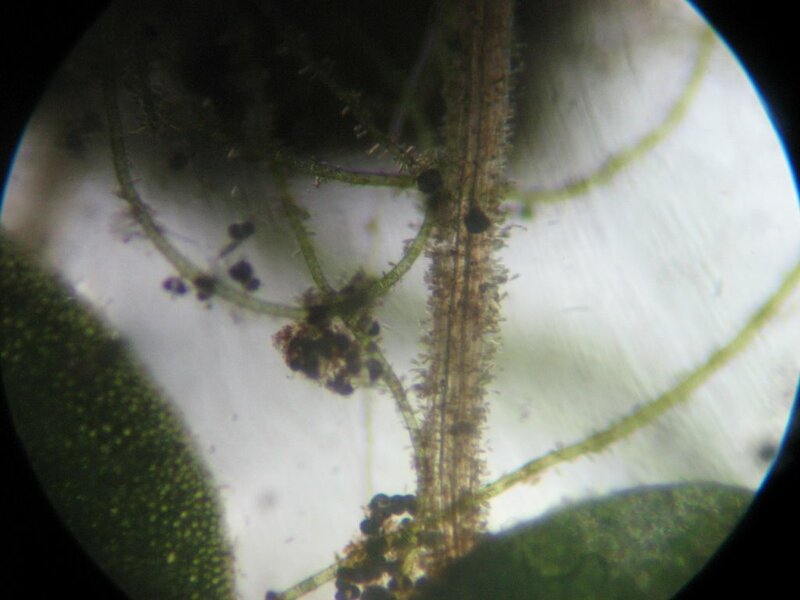 On examination under the microscope I was horrified to fine that is made up of tiny new plantlets of duck weed exactly like the adults but really minute. About the size of a pin prick. I was unable to photograph them as the camera would no focus. Invasive plants gain an advantage by being able to reproduce rapidly, vegetatively and sexually. Sexual reproduction would would make for variety and those lines most adapted would produce vegetatively faster than their rivals. After a few weeks of the pond being almost clear the Azolla has completely covered it. The few green patches are the duck weed. 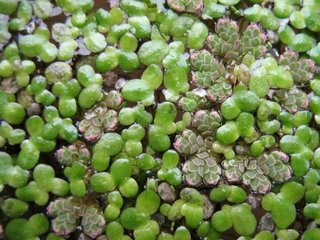 The azolla is so thick that after the rain water can be seen as small pools on the surface. An interesting fact is that Azola is used as a fertilizer in rice paddies. Work is being done on its use in South Africa. 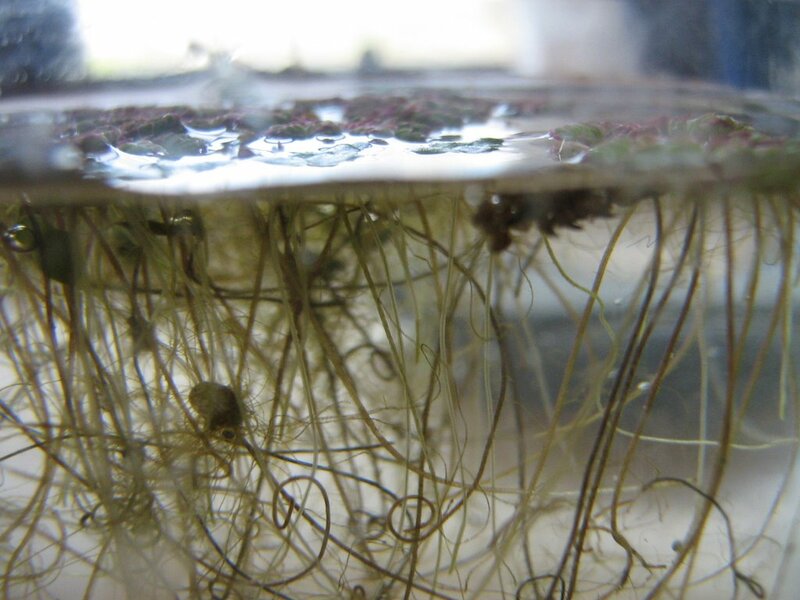 The Azola water fern and duck weed Lemna minor are in no way related as can be seen above. L. minor is related to the arum lilly and the water fern to the tree fern so how far apart could they be.However they have both solved their problems the same way and often live in close association, so much so that they both seem to share the same species of mycorrhiza. It appears to be an Ectomycorrhiza association with a mantel hypha sheath, a Hartig net and external hypha.I have not been able to discover any reference to the micorrhiza in any of the numerous descriptions of duck weed on the internet.None of the drawings or photos of roots show mycorrhiza. do not take up nutrients at all. Roots are for keeping the plant upright in the water, and by entwining with other roots as the top photo shows and keep the plants together to form a mat on the surface of the water.The nutrients are taken in through the bottom side of the leaflets. Whether this holds for the water fern as well I do not know. L.minor is very widespread through many countries and is very invasive but not necessarily always a problem. 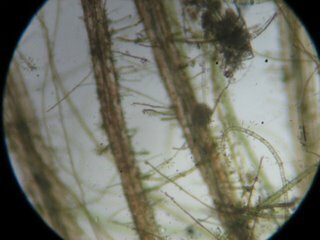 I've been trying to work out whats' happening in my pond with Azolla. It grows then it dies and I'm getting a algae problem (but it's a very ne natural pond converted from a swimming pool using the orginal water which began life chlorinated!). 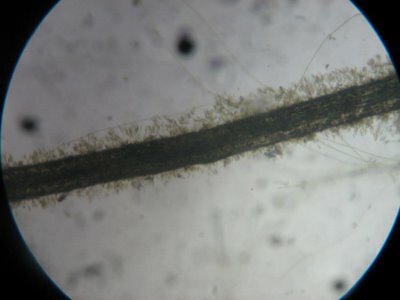 No doubt my goldfish eat the azolla at its "roots" but I'm confused about its overall impacts -- expecially its association with algae.It afterall draws perhaps its Nitrogen from the air and not out of my water. It's a great Nitrogen fixer but I don't want to fix nitrogen into my pond. So I've been pulling it out today and hoping to see what happens with duckweed instead. Ponds are great Gaia exercises. Not self contained of course -- but offering fascinating inter- relationships to study. 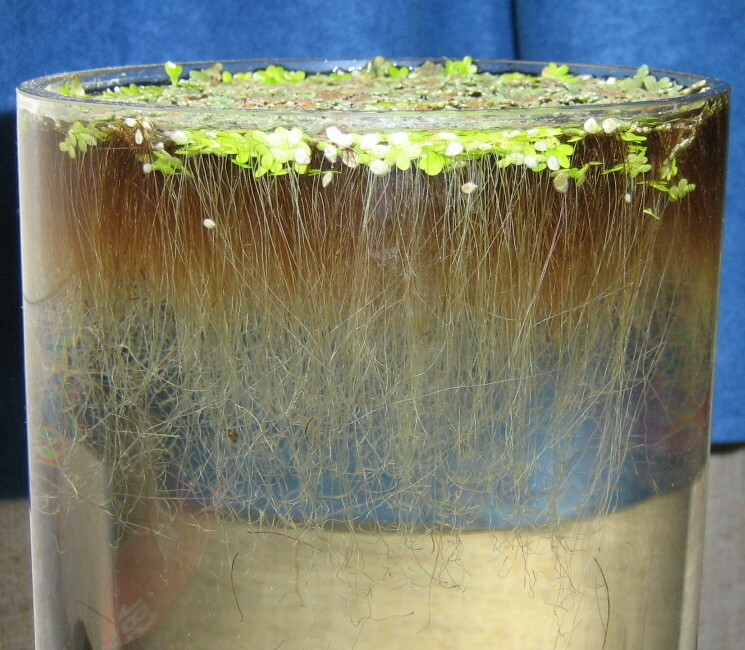 The Azolla fern alternates with the duck weed Lemna minor with the azolla dominant in summer and the duckweed in winter. 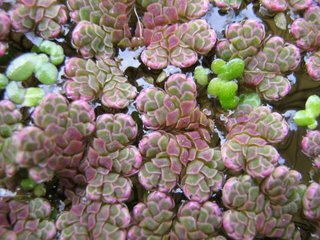 You are right the azolla is in a symbiotic relationship with bacteria which fix nitrogen from the air.I think the azolla will remove a lot of nutrients from the pond which can be used on the garden. My pond's catchment consists of a sheep paddock so is rich in dung. I've found this confusing as Azolla can create a massive amount of biomass --and in my situation a lot of it died. I suspect however my fish(the Goldfish do as my natives don't eat the fern) were eating it at its 'roots' and in the nibbling destroyed it. Otherwise my guess is that my pond is low in Phosphorus as that is a limiting element for Azolla. 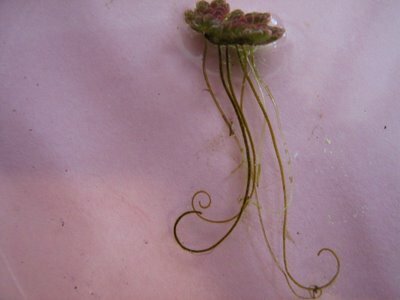 Azolla is so very strange and wonderful -- it's almost like the Day of the Triffids!. If it has all the attributes people suggest it has then it is a great source for mulch and fertilizer. I'm planning to switch to duck weeds to see what the consequences are with them.Another fascinating plant with nutrient absorbing properties but without the Nitrogen fixing from where ever. 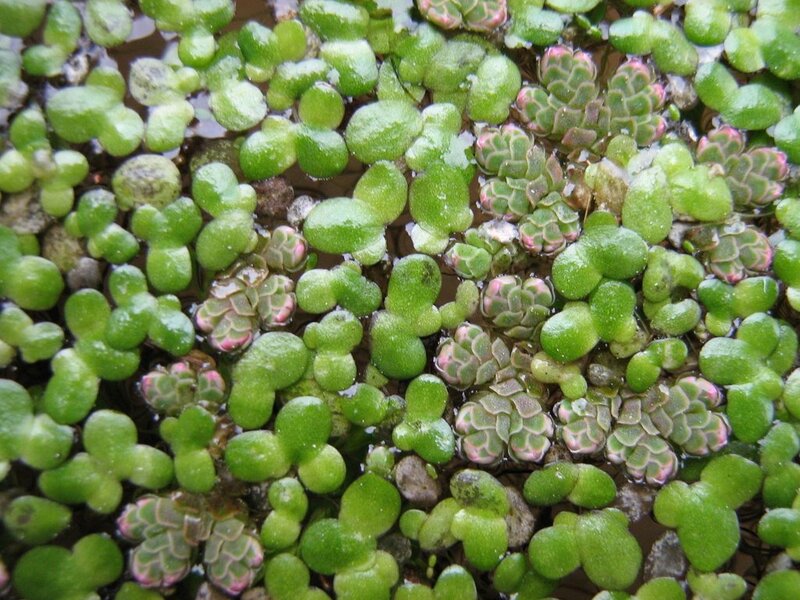 Azolla cannot tolerate very cold winters as found here in New Zealand and dies off and is replaced by the duckweed. What appears to be an enormous amount of biomass is maybe an illusion as the leaves are all filled with air so that when it dies it simply sinks to the bottom.Thats a guess but mine certainly disappears fairly quickly. Could it be that Azola descends to the bottom of the pond when temperature/day length become unacceptable; to return later when these suit? Rice patties have a plant called azola and when you only grow rice, the azola begins to develop to a point where it starts to compete with the rice, and then you have to use an herbicide to kill it back otherwise it will choke out the rice. However, farmers discovered that with the ducks and the fish in the rice patty, they both feed on the azola and so they keep the azola sufficiently under control so it’s not a problem, but the azola also happens to be a plant that fixes nitrogen. So now the farmer discovered that with the droppings of the ducks and the fish, plus the nitrogen from the azola, he doesn’t need any external fertility anymore. It’s all supplied by the system. The other part of the story is that the thing that he discovered was that in this system his rice plants simply did a lot better. His rice is now yielding about 50% more than it did before under this system. So do you get the picture here? He is now, instead of just producing rice, which was producing 50% less, producing rice which is producing 50% more, plus the farmer selling duck meat, fish meat, duck eggs, and now he can now plant fruit trees around the periphery of his rice patties, which he couldn’t do before because of the pesticides that he was using. So now the farmer is also selling fruit off that same farm. Then he would rotate that system with a vegetable/wheat system, and he has sufficient fertility left over from the duck/rice/fish system so that he has adequate fertility for the vegetable/wheat system, and so now he is producing enough food to provide essentially all the food needs for 100 families off that little 6 acre farm. Today there are now 10,000 farmers in Japan who have adopted this system. As far as I can tell it just rots on the bottom It disappears in winter and is replaced by duck weed. Your story of Azolla in Japan is very interesting.